Breeches are a man's bifurcated outer garment, covering the lower body from waist to knees or just below the knees. The term "breeches" is synonymous with any form of short pants or trousers and has been used to describe several types of men's lower-body undergarments and outer garments from classical Roman dress through the twentieth century. However, breeches as a fashion garment were standard everyday attire for European and American men from the sixteenth through eighteenth centuries (American men after 1565). The term comes from Middle English "breech," which was originally the Old English word "bre-c" or "bre'c,"-the -c," a leg covering. The term "breech" also refers to the lower rear part-the haunches or the buttocks-of the human body. Related clothing concepts include breech-cloth or breech-clout, a short cloth covering the loins, also called a loincloth; and breeching, the archaic English term used to refer to the rite of passage in which young boys wearing skirts were dressed in breeches to signify reaching the end of childhood. The term "drawers" is also used synonymously with breeches when referring to a man's knee-length, loosely fitted under-garment of separate legs covering the lower body. However, "drawers" also refers to various women's undergarments that are constructed of separate legs attached to a waistband, especially after the eighteenth plural of "bro century. In common usage today, breeches are essentially distinguished from trousers and pants by length. Various lower-body undergarments made of linen for men have been referred to as breeches in the history of Western dress. These garments ranged from knee to ankle length and were made of diverse fabrics and by diverse construction techniques. For example, the bracchae, or long, shapeless trousers worn by northern European ethnic groups contrasted with the shorter, knee-length, and more-fitted leg coverings called feminalia worn by Roman soldiers and horsemen through the fifth century. By the end of the twelfth century, the masculine wardrobe included some form of knee-length, loosely fitted, natural-colored linen breeches or drawers called braies that were worn under tunics of varying length. The lower legs were left bare, covered by hose or long stockings of woven cloth, or wrapped with crisscrossed lengths of narrow bands like bandages (sometimes referred to as chausses, from the French, a type of lower-leg chain mail armor). Images throughout the Middle Ages show peasants and laborers working in fields or on building sites dressed only in baggy, natural-colored linen braies, sometimes tucked into brightly colored hose worn with short leather boots or shoes. Higher-status men wore longer tunics that completely covered the linen braies. Braies were held up at the waist or hips by wrapping with a cord or belt and images show them to have been thickly rolled over at the top. They appear to be simply cut and sewn to shape around the legs but open and widely overlapped down the front. The prevalent style appears to have been-constructed of a wide, gathered width of fabric draped from front to back between the legs but left open down both sides and tied around the waist or hips or rolled over the top at the waist. 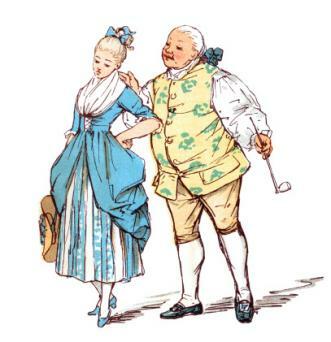 As hose became longer and more fitted to the shape of the leg, braies also became shorter and more fitted, and by the fifteenth century they were no longer seen as part of the outer wardrobe. By the early fifteenth century, the two separate legs of a pair of hose were joined at the crotch by a tied overlap or a codpiece and attached for support to the bottom of the doublet (a short, close-fitting jacket) with laces called points. This body-dominant style became the primary form of men's lower-body covering through most of the fifteenth century, providing the under layer for a variety of outer garment styles and the expression of regional and decorative design features. 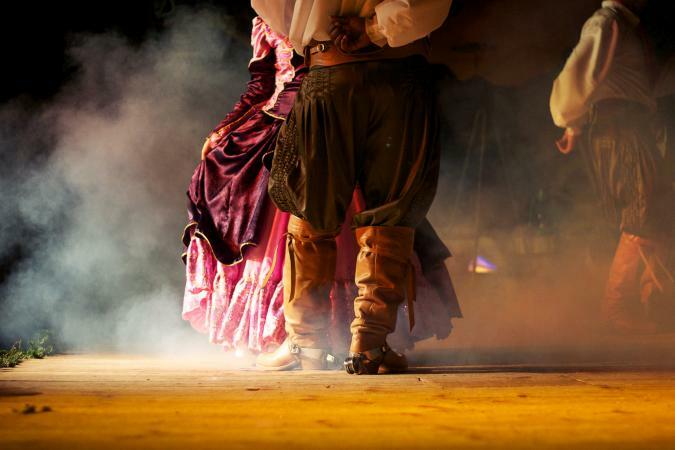 In the first half of the sixteenth century, by the 1540s, the full-length style of men's hose was broken up into two or three different sections called stocks (upper and lower, or nether, stocks) and trunk hose. Nether stocks were tightly fitted, knitted stockings covering the lower legs, ending just below or just above the knees, and sometimes fitted with garters under the knees. They were tied into the leg band at the bottom of the upper stocks. Images show peasants and laborers working with points untied between the upper and lower hose, their lower hose rolled over and falling below the calf. The upper stocks, also called canions, covered the thighs and upper legs and were sewn into or tied onto the bottoms of the trunk hose, which covered the lower torso from waist to hips or mid-thigh. Although trunk hose were short and sometimes barely covered the buttocks in back or upper thighs in front, they were full and appeared puffy. Many were padded and constructed with an elaborate codpiece in front, but the codpiece gradually diminished and disappeared after the mid-sixteenth century. Compared with the lower hose, trunk hose were a more substantial garment designed to match the doublet with all of the fashionable and complex slashings (patterns of deliberate cuts in garments, allowing contrasting linings to show through), panes (narrow strips of fabric sewn over a contrasting lining), and parti-colorings of each period. It is a variation of the trunk hose that became the man's outer garment most commonly known as breeches, which also varied in cut and fit. Like hose, trunk hose and early breeches were constructed with pairs of hand-sewn eyelets along the upper edge and were laced or tied to the doublet for support. It was not until the seventeenth century that breeches became a separate, "stand-alone" garment constructed on a waistband, no longer worn suspended from the doublet. Through the remainder of the sixteenth century, trunk hose expanded, and numerous variations in length and shape were common. Styles called round hose included paned and heavily padded shapes that resembled a ripe melon or pumpkin, ending at or just below the hip. Round hose were shaped and padded with horsehair, wool fleece, cotton, or linen tow. One extreme style of trunk hose rarely seen outside Elizabethan court circles was so abbreviated they resembled a wide pad around the hips, worn with very tightly fitted lower hose. Pluderhose (or pluderhosen, from the German) were another variation of trunk hose that resembled a pair of open breeches. Cut full and long, to below the knee, they were constructed of an under layer of contrasting fabric that spilled out between wide bands or panes of heavier fabric. Trunk hose were at their most exaggerated in the last two decades of the sixteenth century. Different styles of longer, fuller upper hose called breeches were also fashionable in the late sixteenth century. Variations of breeches included Venetians, which were a baggy garment that were quite wide at the waist and tapered to the knee or just below. They were slightly padded to hold their shape and were constructed with seams on both inner and outer sides of the legs. The fullness at the waist was controlled with wide, deep gathers or cartridge pleats. Voluminous breeches called galligaskins, gally hose, gascoynes (from the French), or slops (also slopp or sloppe, from the Dutch) were cut with extra width at the knees, maintaining a bulky appearance without padding. They had a softer and more informal appearance, drooping slightly over the knees with the extra fullness gathered or pleated into a band just below the knee. In the first quarter of the seventeenth century, the extreme and rigid shapes of trunk hose softened, and the full, longer breeches like Venetians and galligaskins were the predominant fashion. Many breeches were embellished with a row of ribbon loops or lace "ruffles" below the knees, called boot hose, to span the area between lower edge and boot top. Shorter styles of breeches were constructed with a wide fitted band over the knees or lower thighs also called canions. After mid-century, a shorter style called petticoat breeches or rhinegraves was most fashionable. There were two types, one bifurcated and one open, but both resembled a full wide skirt and many were heavily embellished with rows of ribbons at waist, hem, and side seam. Wide "flounces" of lace or ribbons over the knees were worn with some petticoat breeches. A flounce is a strip of fabric gathered along one edge and attached to the bottom of a garment, such as a skirt, that creates a ruffled effect. As breeches became longer with varying degrees of fullness in the seventeenth century, the methods for attaching them to the doublet also changed. Earlier trunk hose and breeches were still tied to the doublet lining or waist with laces called points. Ribbon points tied in a bow through the outer waist of the doublet provided an important decorative feature in the early seventeenth century. By the 1620s, however, when breeches replaced trunk hose, they were suspended from the doublet by hooks-and-eyes. Large metal hooks sewn into the waist-band of breeches were attached to hand sewn or metal eyelets on the inside of the doublet waist. By the early 1660s, breeches were no longer tied to the doublet at all, but were fastened instead at the waist with a button or strap and held up on their own by suspending them from a waistband around the body's waist or tying them tightly around the waist with a cord gathered through a sewn channel. Breeches were constructed with a lining, and the center front opening was buttoned up or tied closed. Linen breeches or drawers were also worn as an under-garment with breeches. By the end of the seventeenth century, breeches were quite simplified in shape and trim, slimmer and more fitted to the shape of the legs, but still cut with fullness in the seat, or over the hips and abdomen. They had a cuff or band that fastened just under the knee and were worn with separate stockings that rolled up over the knee. Throughout the eighteenth century, the fit and details of breeches changed as the style of coat and waistcoat changed. During the first two decades, breeches were virtually hidden under the knee-length vest and coat of the three-piece suit, and a somewhat baggy fit did not matter. As coats were cut away after mid-century, breeches became very slim and fit closely over the thigh and knee. As breeches became slimmer, they were cut on the bias to give movement to tightly-fitted thigh and seat areas. Knee-band closures included narrow cuffs with buckles, buttons, or ties. After 1730, as waistcoats shortened, the front of the breeches over the abdomen was more visible. For a smoother appearance, the buttoned-fly front changed. Breeches were closed down center front with a "fall," a large square flap five to eight inches wide, that buttoned to the waistband to cover an open fly. The center-front buttoned fly remained a less fashionable alternative to falls. Breeches reached the end of their fashionability as standard men's garments by the early 1790s. Two other alternatives were gaining prominence, and the term "knee breeches" was used to distinguish them from pantaloons and trousers. Trousers were practical, ankle-length, loosely fitted bifurcated garments closely identified with the working class. In France, the combination of knee breeches and silk stockings was called culottes, and it was this elite style seen in such sharp contrast to the working class trousers that identified the French revolutionaries as sans culottes. 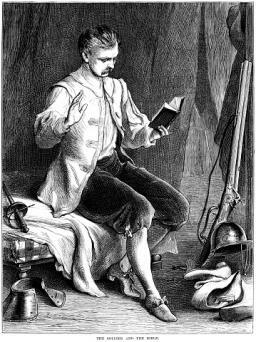 Pantaloons were a type of longer, closely fitted men's day-wear breeches that fit into the top of riding boots. They became a very fashionable alternative to trousers and were worn with a strap under the sole of a shoe to increase the effect of the clingingly tight fit. During the first decade of the nineteenth century, fashionable young men preferred pantaloons or trousers while older generations continued to wear knee breeches. After trousers became standard everyday attire for men, breeches with a square front fall and diagonal side pockets were worn as riding breeches. By the 1890s, however, a specialized type of breeches was worn instead for horseback riding. The inside of each leg in these full-cut breeches was made with leather or suede, and tightly fitted wrappings for the lower leg were eventually constructed as part of this garment, creating the shape of the twentieth-century "winged" jodhpurs still used as riding dress. These late-nineteenth-century riding breeches were also worn by women, constructed with a detachable apron worn for modesty when astride a horse. Knee breeches were worn as the correct form of evening dress through the first decade of the nineteenth century and were worn with tailcoats as day-wear through the first quarter of the century. By the 1840s, the use of knee breeches was limited to British full ceremonial court dress. From the 1860s, the term "knickerbockers" was used to describe men's knee breeches with loose, baggy knees and a knee-band fastened by a strap just under the knee. Knickerbockers were worn as informal country dress, with a sweater or Norfolk-style jacket, and for certain sports such as shooting or golf. An early-twentieth-century style of knickerbockers known as "plus fours" were worn when hiking, biking, or playing golf. The name referred to the four inches added to their length to create an exaggerated overhang at the knee. Breeches were also used as livery for household servants such as footmen and chauffeurs in Britain and North America through the early twentieth century. In the twentieth century, a type of knee breeches was worn with leg wraps called puttees by some officers and troops fighting in World War I. See also Doublet; Men's Hosiery. Arnold, Janet. Patterns of Fashion: The Cut and Construction of Clothes for Men and Women c. 1560-1620. London: Macmillan, 1985. Byrde, Penelope. The Male Image: Men's Fashion in Britain, 1300-1970. London: B. T. Batsford, Ltd., 1979. Chenoune, Farid. A History of Men's Fashion. Translated by Deke Dusinberre. Paris: Flammarion, 1993. De Marly, Diana. Fashion for Men: An Illustrated History. London: B. T. Batsford, Ltd., 1985. Payne, Blanche, Geitel Winakor, and Jane Farrell-Beck. The History of Costume: From Ancient Mesopotamia through the Twentieth Century. 2nd ed. New York: HarperCollins Publishers Inc., 1992. Tortora, Phyllis G., and Keith Eubank. Survey of Historic Costume: A History of Western Dress. 3rd ed. New York: Fairchild Publications, 1998. Waugh, Norah. The Cut of Men's Clothes, 1600-1900. New York: Routledge Theatre Arts Books, 1964.